In Blog Post 126 we looked a little bit at the Devil as a folkloric figure in American witchcraft. One of the questions I received in response to that post was, “but how do I meet him?” Is the Devil an entity anyone can just summon up? Do you have to be careful to call the “right” devil so as not to wind up with more on your plate than you can handle? And if you do meet the Devil, how do you come away with your soul intact (assuming you want to)? Today I thought I’d look at some of the ways, folklorically speaking, that people have been known to get into contact with the Devil or other “dark” spirits. Some of these are based on old European folk traditions, and some call a figure which may or may not be the Devil, but which certainly shares traits with him (trickster nature, otherworldly knowledge, granting of gifts, etc.). A word of warning before we dive in, though: Do NOT attempt any spiritual summoning work or diabolical contact without the proper precautions—while dark spirits can be powerful allies, they also can have a dangerous side and should be treated with respect and caution. So, with that being said, let’s look at some of the main ways to meet your devil. If you’ve ever read Christopher Marlowe’s Faustus, you’ll be quite familiar with this method. In this late 16th century play, Dr. Faustus (quite possibly based on a real person), learns the art of high magic and uses a magic circle to call forth a devil named Mephistopholes, who will act as his servitor on Earth in exchange for his soul. He seals his pact with blood, and pretty much gets what he wants for a while (including Helen of Troy), then gets dragged off to hell for his final punishment. In Marlowe’s version, the imp is a distinct entity, and in some versions of the legend he takes on the form of a dog or other animal to serve Faustus as a familiar. Shakespeare, contemporary to Marlowe, also knew a bit about diabolic invocation through high magic. In his Henry VI, part 2, Shakespeare demonstrates a different version of how such a meeting might go. In Act I, scene iv, a conjurer named Bolingbroke summons the spirit of a devil named Asmath into a witch named Margaret Jourdain (based on a real woman and accused witch named Margery Jourdayne), then proceeds to interrogate the demon for information. He dismisses the devil just before royal authorities break in and arrest everyone present for heresy and treason. So here we have two methods inherited from the grimoire traditions of old Europe: direct appearance and possession. Owen Davies gives an excellent overview of these traditions in his appropriately titled Grimoires: a history of magic books. These late-antiquity and medieval methods of making contact with nefarious forces also found popularity in the New World, mostly through grimoires like the Grimoire Verum, Albertus Magnus’ Egyptian Secrets, and derivative texts drawn from such sources. These tomes influenced magical systems like Pow-wow and hoodoo, though the specifically diabolic elements were often highly diminished by the time they reached the hands of folk practitioners. The exception to this is that the seals found in the Sixth and Seventh Books of Moses were still used for magical purposes, and several of those seals are specifically designed to invoke diabolic aid from entities like Mephistopholes and Leviathan. The Grimoire Verum – This text says that America is ruled by the devil Astaroth, whose sigils are included for your invocational purposes. Please note that you should probably learn a little bit about basic Solomonic invocation and banishing from the Key of Solomon first, though the Grimoire Verum does give a little instruction in these areas as well. The Sixth & Seventh Books of Moses – There is a lot less instruction here than you would find in some of the other grimoires, so if you’re not versed in summoning and dispelling, you may need to look elsewhere. Dr. Faustus – Here is the text used by Marlowe for his Faustian invocation. Bear in mind that this was designed to be staged, so use it more as a guide than a rote ritual to be followed. 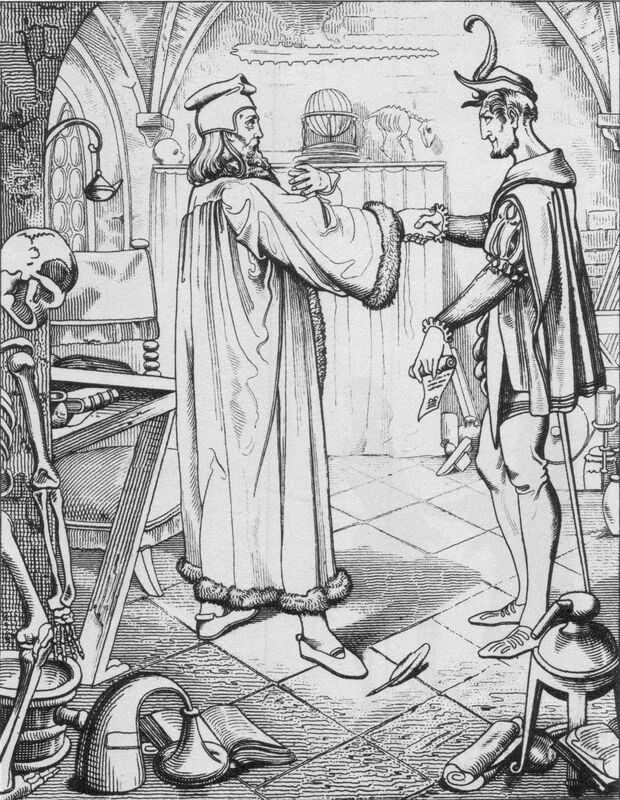 Henry VI, part 2 – Shakespeare’s text for invocation and bansishment. Take with the same grain of salt you used with Marlowe’s work. On the more folkloric side of things, the common method for contacting a devil of some kind involves a journey to a liminal or wild place where he is thought to reside. In most cases, the Devil can be found either at a crossroads or in a forest of some kind, though there are exceptions (many modern stories of meeting the Devil involve transportation or big cities, e.g. Robert Bloch’s Hell-Bound Train, Ray Bradbury’s Something Wicked this Way Comes, and the cult film Rosemary’s Baby). Probably the most famous ritual is the crossroads ritual, which I’ve mentioned here before. As I’m planning to do an article on the crossroads as an independent magical space, I won’t go into great detail, but rather just say that Cat Yronwode has a great entry on the crossroads for those who are interested. The forest or wild place meeting is a common folkloric theme across many cultures. There are, of course, the Teutonic tales of meeting various wild spirits or devils in the forest, as in the Grimms’ tales of the Devil (see “The Devil’s Sooty Brother,” or “The Devil’s Grandmother”). There are biblical precedents for these sorts of meetings as well—Moses encounters the burning bush in the desert, which is at least terrifying if not outright diabolic. Three of the gospels also recount the story of Jesus being tempted in the desert (an analog for wilderness in biblical terms). American folklore picks up this thread, and stories of meeting the devil in wilderness are quite common. “Young Goodman Brown,” by Nathaniel Hawthorne, features such a meeting, and at least one scholar has brought the idea into the twentieth century by suggesting that “Men in Black” sightings associated with UFO’s in rural areas may be connected to devil lore. The other alternative to the forest meeting is the graveyard meeting. Usually in this version of the story, the person meeting the Devil must also do battle with him. It can be a battle of wits, but just as often it is a physical wrestling match which parallels the interior struggle of the person confronting his or her fears by meeting the Devil in a graveyard in the firstplace. Or, just wander to any of these kinds of places, swear yourself to the Devil (or in many cases, against God), and call out to the Devil to come and offer you terms of some kind—a new skill, riches, knowledge, etc. in exchange for service or something intangible like, oh, say, your soul. One final thing I should mention is that the best-case scenario in many of these stories usually involves a person quick-witted enough to outsmart the Devil. So always be aware of just what you say to any devil you meet, and make sure you leave loopholes for yourself if you promise them anything. They seem to enjoy a good trick, so it’s a win-win if you can outsmart them. Again, please be careful with this sort of magic. It has the potential to be dangerous, and at the very least it’s a little intense and can run you afoul of the law if you’re not cautious (loitering at crossroads or in graveyards tends to get the police rather grumpy). If you do have any good experiences with this sort of work, though, please share! I’d love to hear it!